Google Search Console is a free tool provided by Google to help monitor and optimize the visibility of your website in search engines result pages (SERPs). Once you are logged-in, you will need to add your website. Click on the “Add Property” button. Then enter the full url of your website. One thing to keep in mind here is that your website will possibly have multiple domains. A domain is essentially the address to your website. For example, facebook.com, google.com, grazecart.com, are all domains. Is a domain and a URL the same thing? Not technically. A URL does contain a domain, but it also can include more. For example, a URL might be google.com/maps. In this case, you would say that this is the URL to access Google Maps. A subdomain will precede the root domain. For example: maps.google.com. In this case, “maps” is the subdomain. When you first create a GrazeCart site, you will be given a subdomain that matches the farm name you provided. So if your farm name is “Artisan Valley,” the full domain for your website would be artisanvalley.grazecart.com, where artisanvalley is the subdomain, grazecart is the root domain, and .com is the top level domain, or TLD. For another example, let’s say you have registered your own domain: www.artisanvalley.net. In this example, www is the subdomain, artisanvalley is the root domain, and .net is the TLD. 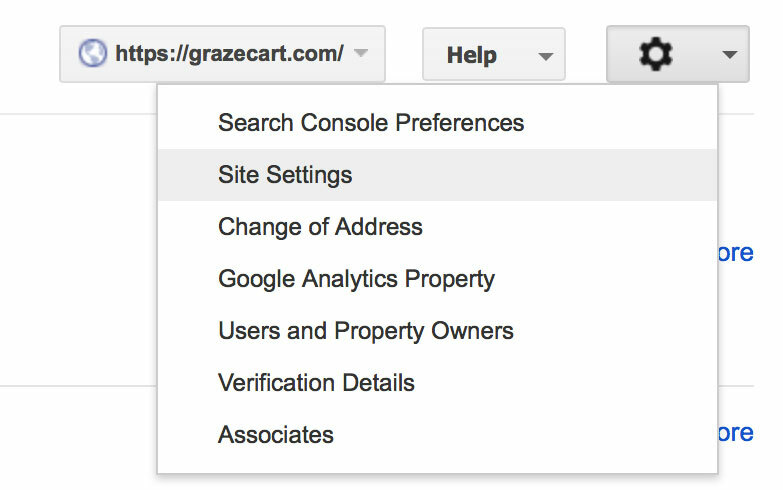 If you are using GrazeCart, you will want to be sure to add your site like this: https://myfarm.grazecart.com. Replace “myfarm” with your own subdomain of your site. It’s also important to include the (s) with https. If you are using a different domain, perhaps one you own like www.myfarm.com, then you will want to add that as well. Repeat the steps above for every domain you have. One of the first things you will need to do is decide on the preferred domain for your website. Many people don’t realize this but the www is not actually a required part of your website address. As was mentioned earlier, the www is what is referred to as a subdomain. It’s common practice to use the www subdomain for your main website, but it’s important to keep in mind that www.mysite.com and mysite.com are techinically two different domains, and search engines like Google will see them as such. It really doesn’t matter which one you use, just be consistent and only use one or the other. Consistency is important because of what are called “backlinks.” You will want any backlinks to your website to use the same domain as much as possible. Backlinks are basically any links from other websites that point to your website. Backlinks are a very good thing (most of the time) because they tell search engines that your website is legitimate. If another website is linking to your site, that is a good indication to search engines that your website is providing valuable information or services that are worth linking to. Search engines want to give searchers the most valuable results, so having lots of backlinks can help your website show up in the SERPs. Ok so that explains what backlinks are, but what does that have to do with my domain? The domain you choose matters because each backlink carries a little bit of value with it. Think of each backlink like a vote for your website. The problem is, search engines are going to see a vote for www.mysite.com and mysite.com as one vote for each different domain. This basically splits your votes. If all your backlinks went to just one domain instead, that domain would have a higher total vote count and would subsequently have a better chance of ranking well in the SERPs. It’s important to let Google know which domain you prefer. To do this click on the gear menu located near the top right, then select “Site Settings”. You will see a section called “Preferred domain”. Select either the www or non-www version depending on which one you use. So we have covered adding your site, and selecting your official domain. Join us next week for part two where we will discuss sitemaps. Try GrazeCart free for 14 days. Get tips on direct marketing and updates on new features.